The activated partial thromboplastin time (APTT) is a measure of the integrity of the intrinsic and common pathways of the coagulation cascade. The APTT is the time, in seconds, for patient plasma to clot after the addition of an intrinsic pathway activator, phospholipid and calcium. The APTT reagent is called a partial thromboplastin because tissue factor is not included with the phospholipid as it is with the protime (PT) reagent. The activator initiates the contact system. Then, the remaining steps of the intrinsic pathway take place in the presence of phospholipid. Reference range varies from laboratory to laboratory, but is usually in the range of 22 - 34 seconds. The concept of separate intrinsic and extrinsic pathways of coagulation is useful for understanding and diagnosing blood coagulation abnormalities in vitro, however it should be appreciated that in vivo there are multiple interactions between the two pathways. The APTT will generally be prolonged when a clotting factor level is less than 30-40%. Since the normal range for most clotting factors is 50-150%, a normal APTT does not rule out the possibility of a mild factor deficiency. In the investigation of a prolonged APTT, pre-analytical errors should be ruled out first. The most common pre-analytical cause of a prolonged APTT is contamination with heparin in a sample drawn from an arterial or central line. The APTT is also affected by an altered plasma to citrate ratio in blue top collection tubes, which may be seen with a high hematocrit (>55%), or a sample with a short or long draw. Other pre-analytical problems include dilution of a sample drawn above an IV, clot formation due to inadequate mixing, and transport or processing delays >4 hours. Therapeutic IV administration of unfractionated heparin is the most common cause of a prolonged APTT in inpatients. Subcutaneous administration of low molecular weight heparin seldom prolongs the APTT more than 40 seconds. Lupus anticoagulants are acquired inhibitors directed against phospholipid-binding proteins and are a common cause of APTT prolongation. In vivo, lupus anticoagulants do not interfere with coagulation factor complex formation on the platelet surface, and are not usually associated with a bleeding tendency. Hereditary coagulation factor deficiencies which selectively prolong the APTT and are associated with a bleeding tendency include factors VIII, IX and XI. Hereditary coagulation factor deficiencies which selectively prolong the APTT but are not associated with a risk of hemorrhage include factor XII, prekallikrein and high molecular weight kininogen (HMWK). The common acquired coagulopathies such as liver disease, moderate to severe vitamin K deficiency, DIC and massive transfusion may cause prolongation of the APTT; however the PT will also be prolonged in these disorders, due to multiple clotting factor deficiencies. A mixing study is used to differentiate between a coagulation factor deficiency and the presence of an inhibitor. It is usually performed by mixing equal volumes of patient plasma and normal pooled plasma and then repeating the APTT. The basic principle is that the normal plasma contributes a sufficient amount of clotting factor to correct for a factor deficiency. A mixing study that corrects the APTT is characteristic of a coagulation factor, whereas one that does not indicates a factor inhibitor. Mixing studies on mildly prolonged APTTs (<5 seconds above upper limit of normal) are confusing and difficult to interpret. Heparin and direct thrombin inhibitors can be ruled by reviewing the clinical history and medication list. However, this review cannot detect a sample that is contaminated by heparin at the time of collection. Heparin can be confirmed by performing a heparin anti-Factor Xa assay. In practice, two types of mixing studies are actually performed: immediate and incubated. In the immediate mix, the APTT is performed immediately after mixing patient and normal plasma. In the incubated mix, the APTT is performed after incubating the mixture for one hour. The incubated mix is not necessary if the immediate mix shows evidence of a fast acting inhibitor such as a lupus anticoagulant. However, the incubated mixing study is necessary to distinguish between a factor deficiency and a time dependent inhibitor such as a factor VIII inhibitor. Two assays are commonly used to confirm the presence of a lupus anticoagulant. The hexagonal phase phospholipid test consists of adding phospholipid to the APTT. The second assay is based on adding phospholipid to the dilute Russell Viper venom test. Shortening of the clotting time in either or both of these assays confirms that inhibition of the APTT is phospholipid dependent. 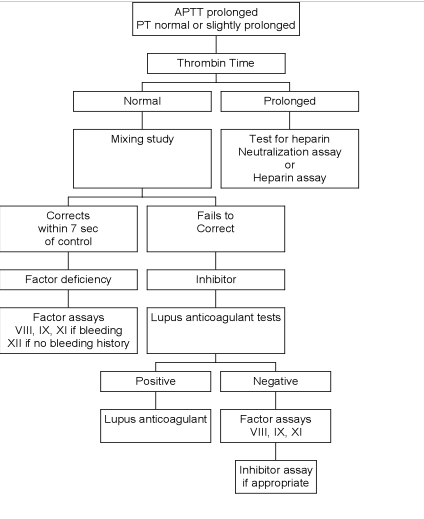 In the realm of coagulation testing, much attention has been paid to the investigation and clinical significance of a prolonged APTT. Little if any attention has been given to the significance of a shortened APTT. There is evidence that increased levels of several coagulation factors (factors VIII, IX, XI, II, and fibrinogen) are independent risk factors for venous thromboembolism (VTE). These factors participate in the coagulation cascade in the intrinsic pathway (factors VIII, IX and XI) and common pathway (factor II and fibrinogen). A study published in 2004 demonstrated an association between a shortened APTT and increased risk of VTE, independent of inherited thrombophilic defects (Blood, 2004;104: 3631-34). Specimen requirement is one light blue top (sodium citrate) tube. To avoid tissue fluid contamination, a 5-mL red top discard tube should be drawn first. Specimen should be delivered to the laboratory within 4 hours. If delivery will be delayed, plasma should be separated and frozen. Also see Coagulation Screen.